Chief Minister Shivraj Singh Chouhan laid the foundation stone of Budhni-Indore (Mangliya Gaon) New Rail Line to be built at a cost of Rs. 3 thousand 262 crores in Nasrullaganj of Sehore district. 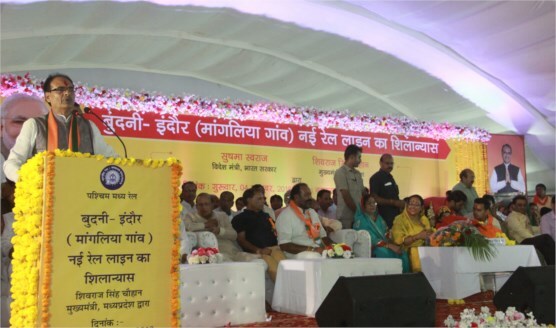 While addressing the public gathering, CM Chouhan said that this rail project will facilitate not only better transport to the villages and towns coming under it but will also accelerate the pace of the development of this area. He further mentioned that this area will be developed as an industrial corridor. He announced the reduction of petrol and diesel prices by Rs. 2.50 per litre. It may be mentioned that the Union Government has announced a reduction of Rs. 2.50 in the prices of petrol and diesel on October 4. In this manner, consumers will receive petrol and diesel cheaper by Rs. 5 per litre in the state. Under the new Budhni-Indore new rail project costing Rs. 3 thousand 262 crores, 6 new tunnels, 64 big and 47 small bridges, 29 railway over-bridges and 86 under-bridges will be constructed. A total of 7 halt stations and 10 new crossing stations will also be constructed. This new rail line will reduce the distance by 68 km between Jabalpur and Indore. The new rail line will benefit Dewas and Indore district and will facilitate a direct contact between Budhni and Bhopal. At present people must move from Budhni to Barkheda Ghat section including Bhopal- Itarsi route. The distance will come down to 219 km from 287 km under this new rail line. Farmers of Nasrullaganj, besides surrounding areas, will link directly to Indore under this project.